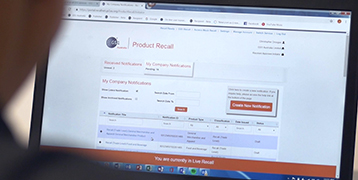 Designed for the food, grocery and general merchandise industries, GS1 Australia Recall is an online portal to minimise the impact and cost of product recalls and withdrawals. Already registered? Log in to start your Product Recall. How to conduct better product recalls. Industry advice for the food and grocery sector. Recall is a secure online portal endorsed by major Australian retailers and associations. The use of the Recall portal significantly streamlines and improves processes and communications in the event of a product recall or withdrawal, enabling fast and effective removal of products from across the supply chain. The complex process of a recall can be made simpler, watch the short animation to see how. Communicate recalls and withdrawals to all trading partners and regulators, via a single whole of industry portal. Reduce risks and cut costs in the way you execute recalls and withdrawals. Target notifications to selected customers with tailored information and progress reporting. Secure system ensures only approved notifications are issued. View, report back on and approve recall/withdrawal notices from any mobile device, from any location at any time. Easily communicate with regulators such as Food Standards Australia New Zealand, Therapeutic Goods Administration, and the Australian Competition and Consumer Commission. Conduct mock recalls for HACCP/standards certification and audits. Clear handling, disposal and reimbursement instructions to speed the recall process. As members of the GS1 Recall Advisory Group, we recommend that all organisations can benefit from the use of the Recall service and strongly encourage all suppliers and recipient organisations to be part of this important industry initiative to diminish risk and improve consumer safety. To learn more about Recall contact us today.